Get gold-standard Masimo SET® oxygen saturation, pulse rate, and perfusion index now—and upgrade later to total hemoglobin, oxygen content, carboxyhemoglobin, methemoglobin, and PVI. Pictured above is the Rad-57 in SpO2 mode. Display features will vary based on the noninvasive measurements loaded onto the device. 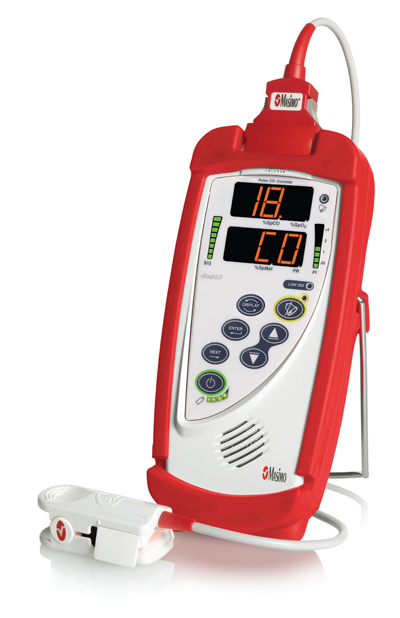 More than 100 independent and objective studies demonstrate Masimo SET provides the most reliable SpO2 and pulse rate measurements even under the most challenging clinical conditions, including patient motion and low peripheral perfusion. Masimo Rainbow® SET technology analyzes multiple wavelengths of light to accurately measure total hemoglobin (SpHb™), oxygen content (SpOC®), carboxyhemoglobin (SpCO™), methemoglobin (SpMet®), and PVI® noninvasively and continuously. > Masimo SET pulse oximetry - Virtually eliminates false alarms without missing true clinical events. > Upgradable Rainbow SET Pulse CO-Oximetry - Compared to traditional invasive measurements, noninvasive and immediate measurements may allow clinicians to provide faster diagnosis, initiate treatment earlier, and improve efficiency. > Total Hemoglobin (SpHb) - Detect chronic or acute anemia, identify hemorrhaging earlier, aid in optimal transfusion management. > Oxygen Content (SpOC) - By calculating hemoglobin and oxygen saturation, SpOC provides a more complete picture of your patients' oxygenation status. > Carboxyhemoglobin (SpCO) - Detect carbon monoxide (CO) poisoning. > Methemoglobin (SpMet) - Identify methemoglobinemia, a dangerous and deadly reaction caused by many drugs routinely administered in the hospital. > PVI - Predict fluid responsiveness, aid fluid management. A: SIQ bar provides continuous indication of signal quality levels. D: PI bar provides continuous indication of perfusion index. E: Low Signal IQ® (SIQ) Indicator highlights conditions of low signal quality. The Masimo Rad-57's easy-to-read screen provides at-a-glance patient status data. > Quick and easy-to-use—requires no user calibration and does not require patient cooperation or consciousness. > Complete replacement for existing handheld pulse oximeters, with factory-ordered options or simple field-installed software upgrades to continuous monitoring and spot check measurements of SpHb, SpOC, SpCO, SpMet and PVI. > Rugged and lightweight—ideal for field or hospital settings. > Awarded Airworthiness Release Certification by the United States Army. > User may program default power-up settings. > Delivers more than 10 hours of continuous battery life. > Up to 72 hours of trending memory. > FastSat® tracks rapid changes in arterial O2 with unmatched fidelity. > SmartTone™ beeps in sync with pulse, even under patient motion conditions. > Sensitivity options of APOD™, Normal, and MAX provide flexibility to support a range of clinical applications. Protective boots are available in your choice of seven different colors. > Rainbow® reusable sensors available in 3 ft., 8 ft. and 12 ft. cable lengths. > Red reusable sensors available in 3 ft. and 12 ft. cable lengths. > Masimo Rad-57 can also be used with Masimo LNOP® and LNCS® adhesive sensors. > Rainbow sensors must be used when reading SpHb, SpCO and SpMet. Red sensors can be used for SpO2, PR and PI only.